Empty signs like this have to be filled, the code says, with a blank if necessary. Albany has a revised sign code, but I can’t see that it will make a noticeable difference in the bewildering array of signs in many of the commercial parts of town. The city council adopted the sign regulations Wednesday night as an amendment to the city’s development code, and they’ll take effect in 30 days. The council was told that the revision’s goal was to make the code content-neutral in response to a Supreme Court decision in an Arizona case from 2015. With few exceptions, government is not supposed to be in the business of regulating speech or, in this case, the messages in signs. The revision won’t make much difference in practice. As far as I can remember, Albany has never regulated signs based on what they said. But there was always the remote possibility that, in these contentious times, somebody might take offense at some obscure provision in the old sign code and take the city to court. The revision makes one little change. A subsection was added “to prevent vacant sign frames.” It requires that a blank sign face be installed if necessary. 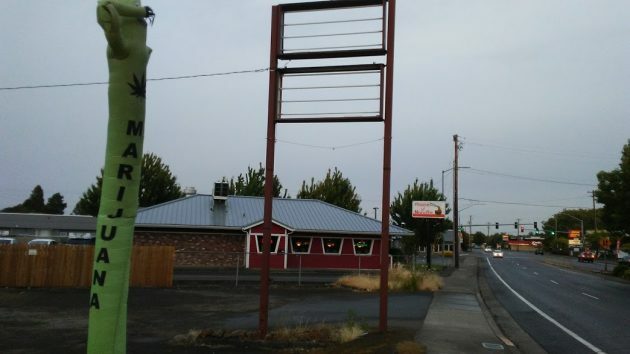 Councilor Rich Kellum wanted to know how long the owner of a vacant sign frame, like the one in front of a marijuana shop at Santiam and Pacific, would have to comply with that change. Planning officials weren’t sure, as far as I could tell. When I was looking at that empty sign frame, which has been there for years without anybody complaining, I could not help noticing the waving tube in front of the cannabis shop. There’s nothing in the old or new code specifically mentioning those waving things, which have popped up lots of places. No surprise on Kellum’s courageous stance. After all, Kellum claims that Albany’s Third Precinct (Kellum’s) voted against Measure 14 back in-the-day. He argued vociferously again during the vote to allow cannabis sales inside Albany borders, but lost. Ever the pragmatic, Kellum did manage an Ay vote on the Albany 3% city sales tax on cannabis sales when that opportunity arose. And now, Kellum – who has never demonstrated ANY concern about empty sign frames, is focused on the empty sign frame in front of the Albany Pot Shop that sits astride the Central Entrance into town. One would think that by this time, where cannabis operations have proven a boon to the City, that Kellum would have something else to fuss over. Of course this would be a high priority for today’s City Council. Albany residents will be proud that they jumped on this major issue right away. Typical of current legislative practice to add one extra (questionable) thing onto a necessary update of a poorly written old rule. The over-riding rule for the City (and County and State) is that local rules only apply to the point that the U.S. Constitution allows – so any part of the old law was, for all purposes, automatically invalidated by the 2015 SCOTUS ruling. In these times, when we are told to expect stronger storms due to climate change, interesting that our City Council chooses to make dormant signs less safe (i.e. more surface area to catch any high wind) and so more likely to be blown over or apart – creating additional deadly projectiles for residents – especially those in need of clean, safe shelter. Perhaps this is really a first step, toward then needing to hire another out-of-state firm (for a hundred grand or so) to study the problem of derelict signage and get back to us in a year or so with their proposal – which will be that the City should further deplete its resources by hiring more firms to design “pro-Albany” themed signage and offer it in place of any “empty” or out-of-date ones – so that the sign owner will be in compliance with a law that didn’t exist when they bought/built their sign holder. The super-bargain priced extra lights downtown are one recent example of how careful this City Council has been with other peoples’ money. Hear, Hear! I’m with you. Albany City Council needs to be drained. That is the swamp that needs draining. I know the purpose of signage is to attract attention, but personally, I refuse to shop at stores that deploy the “wavy things”, or the human-powered sign-boards, or the excessively bright flashing LEDs, or the revolving lights that look like emergency vehicle overheads. These are examples of gaudy and excessively distracting advertising. The Constitution may allow these things, but I don’t feel the need to support them. When the High Priest of Gaudiness sits astride America, holding one pointless “Summit” after another with brutal dictators, what more can one expect. Does the term “trickle down” ring a bell. As far as the human-powered signs go, your kids or grand-kids may need such a job some day the way this country is going with Trumpism and Repubicanism. So, I don’t mind the human-powered signs. A kindly note to the fine, pictured establishment…. If you are not going to use the signage “structure” simply take it down. Remove it. Make the city councilor mentioned happy for once. Please. Making Albany Great Again is of utmost importance and your simple step in doing so will get us all closer to the promise land. A land …well… clean, pure and ? So POT STORE, now do as YOU ARE TOLD!